Everyone has their own version of pizza that they run to on a Friday night. 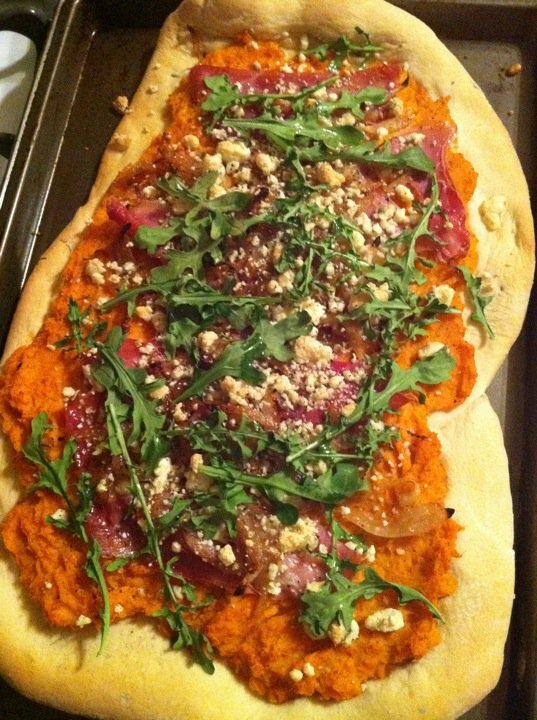 This is my run-to pizza recipe that I adore–homemade pizza topped with spicy sweet potato mash, arugula, crisp prosciutto and feta cheese. When people think of sweet potatoes, they rarely associate them with pizza; however, they are absolutely wonderful. I start by making a pizza dough–you can use any traditional pizza dough recipe you’d like. Next, I peel and boil 3 sweet potatoes until tender and strain them in a colander. Then, I transfer the potatoes to a bowl and season with salt and pepper, however, for an added kick I add 3 tablespoons of brown mustard–set aside. After your pizza dough has rested and you have “punched” it, you may begin to roll out the dough to your desired shape. Being that I love everything that is rustic, I chose to roll out a very rustic oval-shaped dough. From there, I place the dough on an oiled-sheetpan and bake for 12 minutes at 425 degrees. Simultaneously, I place a few strips of prosciutto on a separate sheetpan and allow this to crisp up in the oven. After about 5 to 6 minutes, remove your prosciutto and let cool. Remove the pizza dough and then smother it in your sweet potato mash. From there, break up your crispy prosciutto over the entire pizza–this is starting to look good. Finally, finish the topping with two good-sized handfuls of feta cheese and create an even layer over the pizza. Transfer the pizza back to the oven for another 10 to 15 minutes to let the cheese melt and the dough finish cooking. Last, remove the pizza from the oven, toss some fresh arugula on top and then drizzle with olive oil. This pizza should not only add a fun twist to an old classic, but also, please any crowd you’re willing to entertain. We always went for pizza takeaway. We’ve never tried homemade pizza, but your post is making me think we should.